This information page explores a selection of cell culture types, parameters, and units for eukaryotic cell cultures obtained from vertebrates and invertebrates. Plant cell cultures also get a brief mention, e.g., cells from the Arabidopsis. Cultures from prokaryotic organisms that are typically cultivated in microbiological incubators are not covered here. 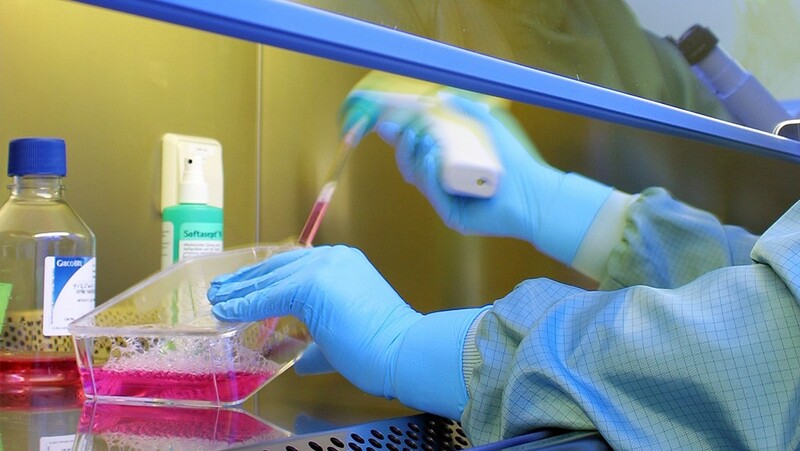 Various cell cultures are used in cell culture laboratories across the globe to perform a whole host of tasks: in pharmaceutical research, medical research, reproductive medicine (IVF), and regenerative medicine (transplants, prostheses, tissue engineering) – the list is virtually endless. At this point, we think it would be helpful to explain the terms “in vitro” (= under glass or inside the test tube) and “ex vivo” (= out of the living). We use the term “in vitro” to refer to cell and tissue cultures that are kept outside the organism under artificial physiological conditions. Typically, these are kept under simulated temperature and humidity conditions inside CO2 incubators or CO2/O2 incubators in/on cell culture vessels, plates, and dishes containing culture media such as RPMI 1640, DMEM, or Ham’s F-12. Such cultures can survive indefinitely, as is the case with the immortalized HeLa cell line. Ex vivo designates processes whereby living material is removed – e.g., blood is taken for treatment – and promptly returned to the body once the cells have been cultured inside a CO2 incubator. For instance, in the case of ex-vivo gene therapy, genes are placed into cells. Primary cultures originate from cells, tissues, or organs that are taken directly from an organism. After the first subculture (secondary culture) or passage 1, one significant feature of the resulting cell line’s limited life span is that it corresponds to the natural aging process of the living organisms. Primary cultures obtained from normal tissue need a solid substrate to enable anchorage (adherent cultures) while tumor cells can be cultivated in suspension. Cells with specific properties that have been derived from a primary culture or a cell line by means of selection or cloning are called a cell strain. The defining feature of immortalized cells is their ability to divide indefinitely. This “immortality” is achieved by infecting the cells with viruses such as the human papillomavirus HPV18 (HeLa cells), by transfecting them with immortalized genes or proteins, or by using hybridoma technology. The latter involves fusing antibody-producing B cells with myeloma cells (tumor cells) in order to produce monoclonal antibodies. One of the most famous permanent cell lines is the HeLa cell line, which was extracted from the cervical carcinoma of an American woman called Henrietta Lacks in the 1950s. This was the first ever immortalized cell line to be obtained from a human cell. Since then, more than 50 metric tons of HeLa cells have been grown in laboratories across the world. Science has the robust HeLa cell to thank for umpteen thousand experiments and results. However, the HeLa cell line is not the only permanent cell line to have become an established part of research. The list of available human and animal cell lines now contains more than 4,000 entries. These include the Vero cells (African green monkey cell line), the HEK-293 cells (human embryonic kidney cell line), and the K562 cells (the oldest human leukemia cell line). Adherent cells, such as HEK-293 and CHO (Chinese hamster ovary) cell cultures, will only grow and multiply if they are able to anchor themselves to the surface of culture vessels. As a two-dimensional cell culture, they will continue to propagate across their substrate in a layer that is one cell thick (monolayer) until contact inhibition occurs (the cells reach confluence) and the culture ultimately dies. That is the reason why roller bottles are used in CO2 incubators to increase the size of the growth area. Shakers are also used to improve the growth conditions for adherent cell cultures. Both options are used for scale-up. To keep cultures in the lag phase, regular passages (transfers to new culture vessels containing fresh culture medium) are required. Suspension cultures or non-adherent cultures are human, animal, or plant cells that multiply in a liquid culture medium without anchoring themselves to the culture vessel. Only a few cell types are suitable for a suspension culture, one example being NS0 (mouse myeloma) cells, which are used in biomedical research as well as the production of therapeutic proteins. CO2 incubators are used to scale up suspension cultures, e.g., in spinner flasks or rotating shakers. Plant cells can likewise be cultivated in vitro. These cultures are initiated by explants from leaves, stems, bulbs, ovaries, anthers, or roots. When cultures are photosynthetically active, care must be taken to ensure an adequate level of illumination and an appropriate light spectrum, e.g., by using plant growth chambers with Fluora® growth lamps or Arabidopsis lamps. Roller bottles are also used in plant growth chambers (e.g., for scale-up) as are rotating shakers. Various market analyses are projecting strong growth for the global cell culture market of between $30 and $35 billion by the year 2023. These analyses take account of application areas such as the pharmaceutical industry, biotechnology, cancer research, and tissue engineering; laboratory equipment such as autoclaves, bioreactors, centrifuges, and filtration systems; and consumables such as serum-free medium and antibiotics. 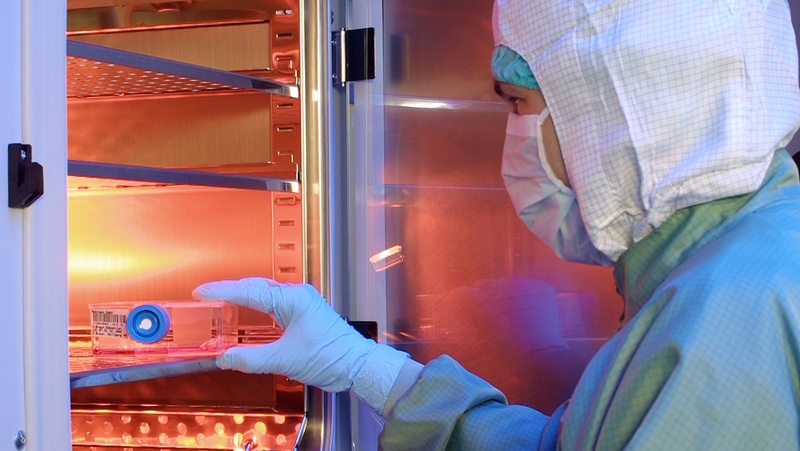 The market for 3D cell cultures alone is expected to be worth more than $2 billion by 2019. Compared to the 2D cultures already described, 3D cell cultures are more similar to cells in vivo with regard to their morphological, metabolic, and functional characteristics. 3D culture systems can be divided into two categories: matrix-based and matrix-free systems. These offer unique potential as testing and research systems for medical and pharmaceutical studies. For instance, 3D tumor models, 3D skin models, 3D intestinal models, and 3D liver models now all exist. 3D cell culture systems are used in drug development, biological and medical research, in the areas of regenerative medicine and tissue engineering, for environmental analysis, and as a substitute for animal testing. Biopharmaceuticals are another area with huge financial potential. A constant increase can be seen in the number of biopharmaceutical active ingredients produced with the aid of mammalian cells. These include Herceptin, a breast cancer drug created from CHO cell lines. Large bioreactors or fermentation tanks are used to make the active ingredient but even fermenters with a volume of more than 10,000 liters usually only produce a few kilograms of the AI. One of the most successful examples of large-scale cell cultivation is the production of Epoetin α and β (Erythropoietin or EPO) using a genetically modified subclone of a CHO cell line. EPO is a human protein hormone that plays an important role in the formation of red blood cells and that is mainly prescribed by doctors to cancer and kidney patients. With an annual sales volume of around €10 billion, it is the world’s leading biopharmaceutical. Monoclonal antibodies that are all cloned from a unique parent B cell – making them identical and highly specific – can also be grown inside a CO2 incubator in large quantities. Within the field of medicine, they are used for both diagnostic and therapeutic purposes. Right from the start, it is essential to factor in product, personal, and environmental protection as well as the GLP/GMP requirements. Beginning with lab planning, this also extends to setting up the lab and furnishing it with laboratory equipment, culture vessels, and culture media right through to the choice of pipette. Biological safety cabinets and CO2 incubators should be placed very close to each other. The doors of the CO2 incubator should open outward into the workplace. This is particularly beneficial when passaging cells, as the culture vessels can be removed and loaded quickly via the shortest route. It is also very important to choose the correct installation location within the laboratory. As well as avoiding locations where laboratory equipment is exposed to direct sunlight, it is just as essential to avoid areas where there is significant air movement, e.g., locations close to doors or underneath ceiling-mounted air conditioners. Furthermore, it is vital to observe the manufacturer’s specifications concerning the wall clearances required on every side. It almost goes without saying that all laboratory equipment must be aligned using a water level. Further examples of equipment found within a cell culture laboratory include centrifuges, refrigerators, freezers, cell counters, cryostats, microscopes, pipettes, and pipette holders. Culture media are an important part of cell culture because they provide the necessary nutrients, growth factors, and hormones. However, they also play a key role in regulating the pH value and osmotic pressure. There are three main types of media: Basal Medium Eagle (BME), reduced-serum medium, and serum-free medium (e.g., for hybridoma, CHO, keratinocytes, and insect cells). Some further specific examples are: RPMI 1640, Dulbecco’s Modified Eagle Medium, or Ham's F12. Balanced salt solutions, such as Hank’s salts or Earle's salts, are used for washing and short-term storage (a few minutes). Learn all the tips and tricks for CO2 incubators here! Most mammalian cells feel right at home at a pH value of 7.4. Transformed cell lines prefer slightly lower pH values of 7.0 to 7.4 while normal fibroblast cell lines have a preference for slightly alkaline pH values of between 7.4 and 7.7. Insect cell lines, such as Sf9 and Sf21, have an optimum pH of 6.2. 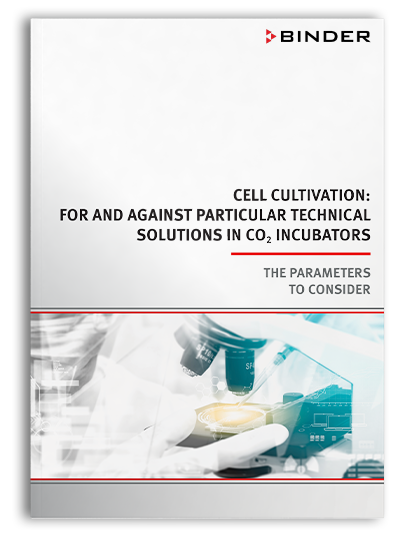 In their operating manuals, some manufacturers of CO2 incubators provide useful information to explain how the pH values in media depend on the concentration of CO2 in the incubator. Example: If a pH of 7.2 is measured in a medium buffered with 2.20 g NaHCO3 per liter, the concentration of CO2 in the medium environment is 8 vol. %. The CO2 concentration inside incubators is measured using either an IR sensor (infrared sensor) or a TCD (thermal conductivity detector). The normal concentration of oxygen in air is 21 vol. % (normoxia). However, fatty tissue has an oxygen concentration of around 10 to 15 percent, whereas in the bone marrow, the figure is approximately 6 to 7 percent. By contrast, sensitive tissue, such as the lung or retina, requires hyperoxic conditions (21-90 vol. %). In order to achieve oxygen concentrations lower and higher than 21 vol. %, it is necessary to use CO2/O2 incubators. More information about this can be found in our blog post on the subject of normoxia and hypoxia. All cellular processes are temperature-dependent. The optimum temperature for mammalian cell cultures is 37°C, whereas cell cultures from insects, fish, and amphibians usually require a temperature of 25 to 28°C. High humidity values in CO2 incubators minimize evaporation rates in culture media so that the desired osmotic concentration (osmolarity) is maintained. Various options are available for controlling the temperature and humidity in CO2 incubators. More information about cell cultivation can be found here! 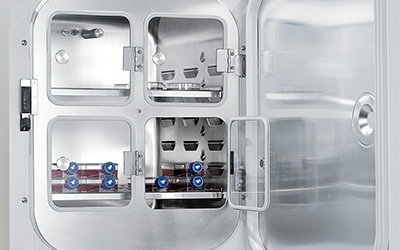 A well-thought-out incubator concept has to cover, control, and regulate a multitude of different parameters – from interior factors such as temperature, CO2 content, oxygen content, or humidity right through to the selection and cleaning of the incubator materials as well as incubator validation. Each criterion has a role to play in cultivating tissue inside the CO2 incubator. Indeed, many set values are absolutely vital for the cell culture’s survival. The aim of every cell culture laboratory is to achieve good cell growth. This also means consistently eliminating and mastering the contamination risks posed by bacteria, yeasts, fungi, and mycoplasma, as well as the risk of cross contamination. Sources of contamination can take the form of contaminated cell cultures, equipment, surfaces, media, reagents, and also airborne germs. However, it is humans that are the biggest source of contamination. Wash your hands before and after working with cell cultures to reduce the risk of contamination/cross contamination. Wear protective clothing such as gloves, a hairnet, a lab coat, a face mask, and shoe covers. Wristwatches, rings, and cell phones are all potential sources of contamination. Before opening the glass door of a CO2 incubator, first check the location of the culture vessel you intend to remove. You should then open the glass door with caution, quickly remove or insert the culture vessels, and finally close both the glass door and the unit door. The work surface of a safety cabinet should be cleaned at least once a day, and the entire interior workspace at least once a week. UV emitters and HEPA/ULPA filters should be replaced in good time. Workstations should be cleaned regularly with 70% ethanol. Any spillages should be cleared away immediately. Sterile reagents and media will become contaminated if they are handled and stored incorrectly. The risk of contamination can be reduced by paying careful attention and using appropriate sterilization methods, such as autoclaves and sterile filters. In the context of CO2 incubators, the “less is more” principle encompasses a multitude of design features that ensure good growth and counteract the risk of contamination. Examples include: having rounded corners inside an incubation chamber and no welding seams, doing away with unnecessary fixtures (such as those for guiding the air inside the incubator), and doing away with fans and HEPA filters in the interior. To find out what else is important, see our Buyer’s Guide for CO2 incubators. Who knows what possibilities cell culture will open up next, but perhaps it will be organs in a dish, in-vitro food, or brand-new therapeutic approaches! Just as cell culture itself is continually evolving so too are our CO2 incubators. For instance, our new CB 170 incorporates some great new solutions such as a new IR sensor, smaller external dimensions in combination with a larger interior, DuoDoor™ – a brand-new smart solution for door operation, and the new and innovative “quick sample access” option. We have retained the tried-and-true 180°C hot-air sterilization for fully sterilizing the entire interior, which has now become the gold standard, plus the stainless steel interior without any welding seams and our patented humidity management technology. Want to get acquainted with our latest CO2 incubators? We’ll be happy to advise you!